These cookies are spectacular. Like, they are unreal good. They very well may be the best cookies that I have ever eaten. The only problem with them is that my wife loooooooooooooves them. I don’t get to eat too many of them before they are gone (also I let her have them). I actually made these last year for Christmas, but I literally did not get the chance to taste test or photograph since she ate them all. So, I made them again this year and probably will be making over and over again for Christmases to come. The cookie itself is very soft and almost brownie-like. Chocolate chunks add in some texture and another chocolate flavor boost. The rolo baked in the middle almost goes unnoticed. I wonder if the cookie could be improved if I used regular caramels instead (although these might be too large). The master stroke that puts these cookies over the edge is the salt on top. So good! In a medium bowl, sift flour, cocoa, baking soda, and salt. Set aside. Cream butter in a stand mixer on medium speed for 20 seconds. Add the sugars with the mixer running until mixture is light and fluffy. Beat in the egg and vanilla, scraping down the sides as necessary. Slowly add dry ingredients to wet ingredients, then stir in the milk. 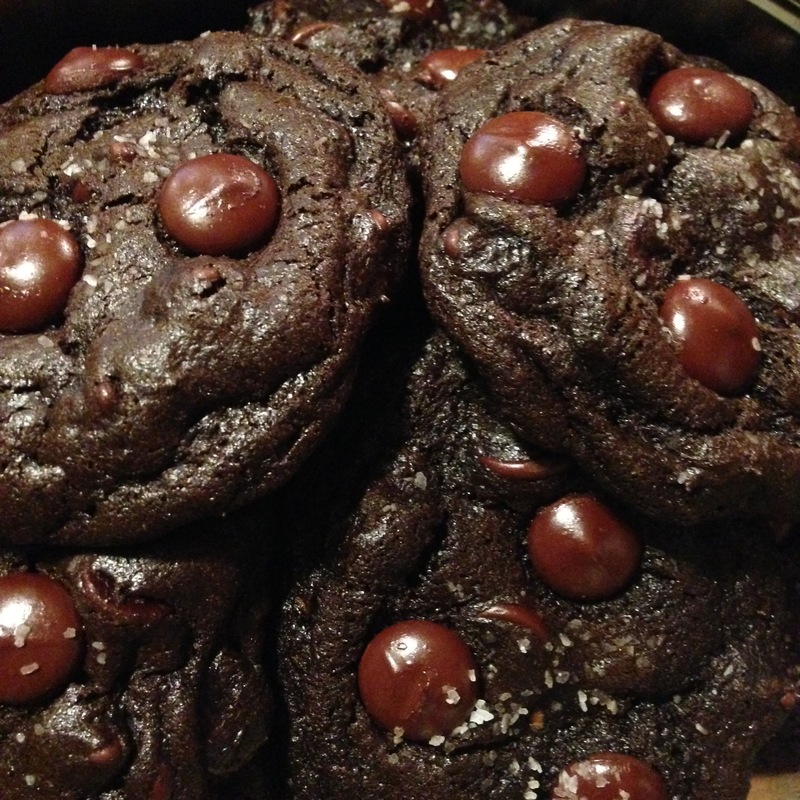 Fold in the dark chocolate morsels. Chill dough at least 1-2 hours or overnight. Take two tablespoons of dough, split in half, and roll each half into a ball. Stick caramel into one ball and top with the other, sealing the sides and rolling combination into a larger ball. Sprinkle each cookie ball with coarse salt. Bake 12-13 minutes (cookies will appear under-baked). Remove from oven and let sit on baking sheet for 5 minutes before transferring to a wire rack to cool completely.